I've always wanted to travel abroad, on top of my list is London, England. It's still my dream destination. I'm happy that someone will be flying to London with her mom after winning in a British themed singing contest hosted by Costa Coffee. Jyl Orila was awarded the grand winner for the ''Sing Your Way to London" promo. Few months from now, she will be sightseeing in London, Buckingham Palace, Tower Bridge, Abbey Road, Notting Hill, and other landmarks. The competition was originally inspired from vlogger Vince Vandorpe, after he impressed Costa Coffee barista while singing a British classic at the counter, winning a free cup of coffee in the process. Soon after, Costa Coffee launched a search calling for aspirants to send in a video of them singing a British song. 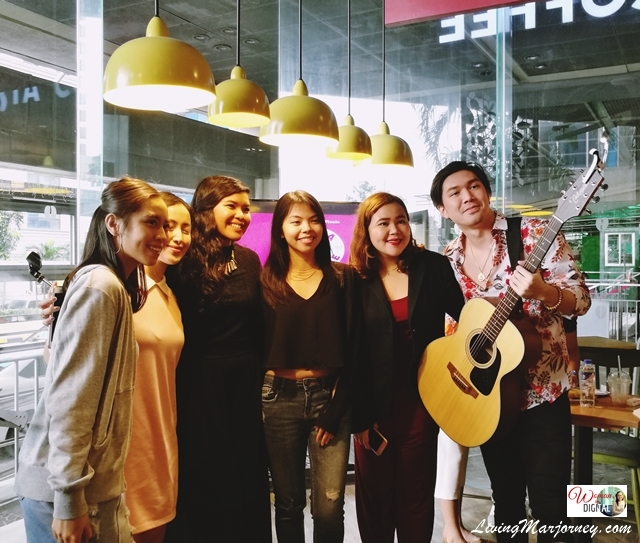 From hundreds of contestants, Costa Coffee chose the Top 5 contestants who battled at the Costa Coffee Robinsons Galleria branch yesterday. They were judged by three personalities including social media influencer David Guison, singer-siblings Kiana and Paolo Valenciano. The criteria for judging included voice and presentation skills, audience response, and adherence to the British theme. They were all great. I wish I could sing and perhaps joined this contest, lol. We also had a wonderful time watching them perform. At the end it was Jyl Orilla was crowned for the Sing Your Way To London with the song 'Send my love ( to your new lover)' by Adele. Jyl received an all-expenses paid trip to London for two. They will be visiting Costa Coffee in UK and will receive other prizes. Here's a video of their #SingYourWayToLondon performances, please subscribe to my LivingMarjorney YouTube Channel here. Check out Costa Coffee PH’s Facebook page for future promos. Sing for coffee, #SingYourWaytoLondon. Congratulations to all the contestants and to the lucky winner.